Oatcakes are delicious, crisp Scottish crackers to be enjoyed as an appetizer toast or as an accompaniment for a plate of cheeses! 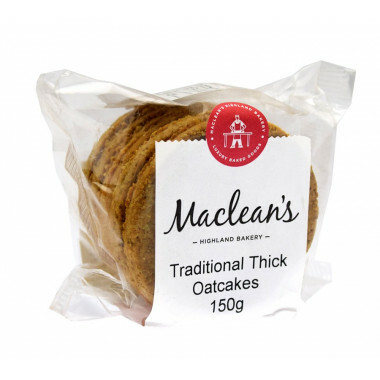 The Maclean's have been master Scottish bakers for four generations. In the picturesque town of Forres, located in the region of Moray in Scotland, the Maclean family manages today, three different sectors in their activity of bakery: artisan bakery, retail shops and wholesale customers as well as, of course, their production of biscuits. The Maclean's use natural, local ingredients; they draw inspiration from Macbeth and cherish skills inherited from a family steeped in Scottish traditions, to produce a range of products enjoyed, again and again, by their customers. Ingredients: oatmeal (66%), palm and rapeseed oil, wheat flour (calcium carbonate, iron, niacin, thiamin), milk powder, raising agents (E500, ii, E450i), salt.